Keahi Schmidt was lost. Two strokes left her with an unreliable memory and difficulty talking. When she re-entered public life, she felt like an outsider. People laughed at her stutter and made her feel less than. She turned to Facebook as therapy. Here, her passion helped her find her voice. She started noticing posts for lost pets on personal and group pages and making connections—someone had found a dog on one page that someone had lost on another. She connected people, too. A group of women came together to do this work. They helped each other and relied on each other and eventually they built a group of animal heroes 12,000 people strong. These women became administrators of Paw Posse Ohana, a Facebook group that reunites lost pets with their families. The five women running the page spent long days and nights messaging each other and talking through all the positive and negative emotions that come with animal rescue. They developed deep bonds even though they didn’t meet each other in person until they’d been working together for a year. Schmidt gets on the computer before she gets out of bed in the morning. She’s command central — searching, cross-referencing, and tagging her page administrators. Her service dog, Bear, doesn’t leave her side. Bear is a 90-pound pit bull Labrador retriever mix with a giant grin and a whole lot of love to give. He helps Schmidt brace herself when she gets up and provides emotional support. He’s been a bright spot in her post-stroke life. Once she tags her administrators, they reach out to their community contacts and go out searching for and picking up animals. 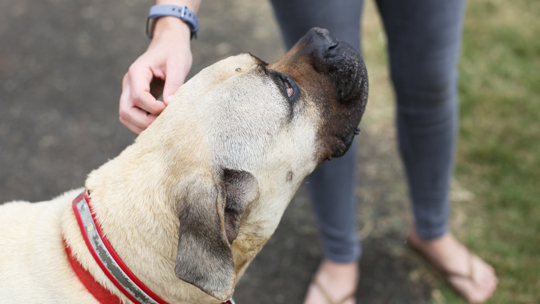 From there, Schmidt checks in with agencies like Hawaiian Humane Society, Honolulu Police Department, and Veterinary Centers of America for sightings, lost and found reports, and microchip matches. Paw Posse Ohana is the first group of its kind, bridging the gaps between these agencies and taking on rescue work themselves. Deborah Wilson, a Paw Posse administrator, says they fight like mad to find out what animals are missing and immediately find people who are missing pets. Families who’ve lost a pet are heartbroken and frantic, but Paw Posse strives to give them hope through action. Stan Sato is an active member of Paw Posse Ohana, re-posting missing pets and looking for lost dogs when he can. He pays it forward because he knows the heartbreak of losing a pet. It was a cool Monday in October when Sato came home from work to find his dog, Lily, missing after his neighbors set off fireworks. “It was sheer panic,” says Sato. “You don’t know what to do. You just reach out to every resource you have.” Soon after, Wilson reached out to Sato and put him to work. He made signs and contacted anyone in his community that he thought could help. After five excruciating days, Wilson and posse member Nani Brown looked for Lily in the gulch behind Sato’s house and found Lily within 15 minutes. “She’s one of the best dogs I’ve ever had. Everybody says she’s sweet. Everybody uses that term—that she’s a sweet dog. And she is,” Sato says. 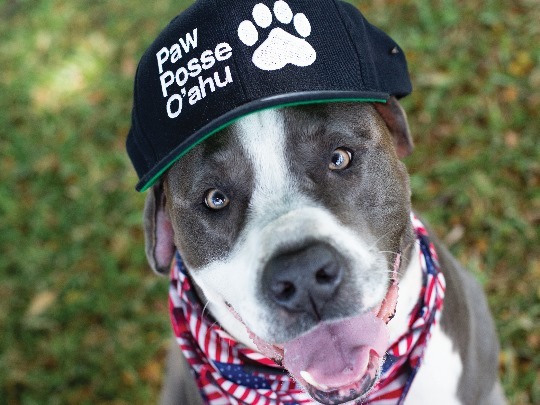 Paw Posse Ohana has built a community that transcends their online group. They’re connecting pet owners and organizations across O'ahu, offering help to those who need it most. Wilson says that at a time when politics is ripping people apart, saving animals is something everyone can come together to do for all the right reasons. This connection isn’t lost on Schmidt. She says their aloha is what makes Paw Posse Ohana different. In fact, ‘‘ohana” is a new addition to their name that came from the sense of family in the group. She says creating the Posse helped her find both family and purpose, along with thousands of furbabies. The gathering place for cat lovers and Hawai'i’s cat colony caregivers. Join this group to get advice from other cat owners and lovers, see what’s new with the cat community, and learn about upcoming events. Hawai'i’s largest online crime-fighting community locates stolen belongings, identifies criminals, and works with HPD to solve crimes. Photos, stories, and advice for hikers across O'ahu.